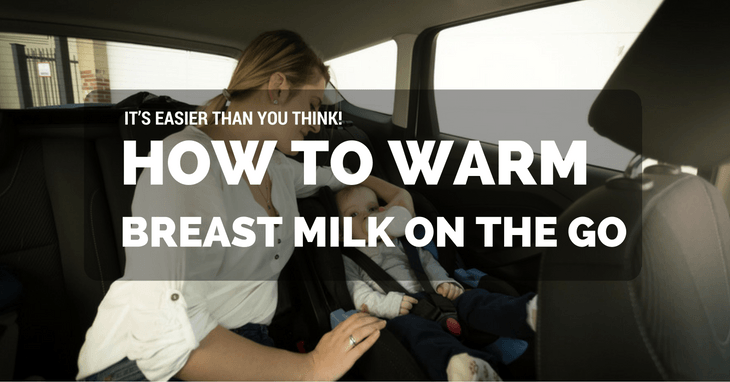 →How To Warm Breast Milk On The Go: It’s Easier Than You Think! When you become a mother, you gain so much respect for other mums because you know, it’s one of the hardest ‘jobs’ in the world. Whether you stay at home or go to work, there are several instances when we have to know certain ‘skills’ that will make everything more convenient for us. An example is, knowing how to warm breast milk on the go. For infants, the ‘food’ should always be ready because when they’re hungry, you need to feed them ASAP. Anticipating needs is in our nature, so it’s always best to be prepared. It is quite handy if you’re the designated driver and your other half has to do the feeding. Portable bottle warmer: There are some that don’t require any electricity source or batteries. It's very useful for those who need to heat up their milk when out in public or travelling. However, there is also the type which you can plug in your car to heat up.You may need to be extra careful with this though especially when you have restless kids in the vehicle. It’s dangerous to have them anywhere nearby. Always make sure to keep a decent amount of distance so nobody can reach out and grab it thus preventing any untoward accident. Cup of hot water: In restaurants or gas stations, you can ask for this. It’s not exactly an ideal way to warm the breast milk, but in the most stressful situations, it could be your best option. You need to be extra watchful because you wouldn’t want to leave any hot spots which can potentially burn your baby’s mouth and throat. It isn’t the best means, however, if your little one is already throwing a crying fit.It would be good though if you use this in preparing for the next feeding. Thermos filled with piping hot water: This is what I find to be the best choice among everything on this list if buying a warmer isn't your priority. It’s handy and convenient. It doesn’t require much, too. But I guess the downside to this is it won’t last the entire day. You need to re-fill with another batch of scorching hot water after a few hours. Also, you can’t do this in the car or at least; I prefer not to. You have to find a flat surface away from the kids.This way, you avoid getting burned if the water spills. Wash your hands with soap and water. I know this is a no-brainer, but sometimes, we tend to forget it. You may unknowingly and unintentionally introduce bacteria to your baby by skipping this fast and easy step. It’s more important to observe this practice when using public facilities like a sink. If you need to use the frozen bag of milk immediately (like when you’re already in a rush, and the baby suddenly feels the need to feed), remove it from the freezer. Check the cap or seal to make sure no water gets inside, and no amount of milk would spill out. Then, run warm water over it thoroughly. Make sure you distribute the heat evenly and don’t focus on one area alone. You can gently shake the mixture to avoid hot spots. Continue doing so until it’s already at room temperature. If it’s inside a bottle, your baby has to consume it in no more than an hour. A portable bottle warmer is easy to use depending on the type you bought. There are advantages to using this gear. First off, it doesn’t overheat the milk. Extreme heat can cause the milk to lose some of its antibodies, essential nutrients and immunity properties. Second, you don’t have to deal with hot water especially when using battery-powered warmers or those you can plug into your car. You just have to put the feeding bottle inside and wait. There are products which will warm the milk in less than five minutes. When travelling, you can fill a thermos with piping hot water. Before your baby’s next feeding, you can pour some of the water into the cup container (usually the top part) and soak the bottle in it. Since you’ll most likely just fill it up halfway to avoid spillage, you can take out the bottle once in a while and gently mix. You may need to stay away from anyone especially the kids while warming the milk, though. Avoid doing it inside the car. Another option for this is to put the bottle inside a travel thermos cup and fill it with the right amount of hot water then seal. Just take it out a few minutes before use. Test the milk temperature by squirting a few drops on the inside of your wrist. This way, you’ll know when it’s ready. You want something that’s comfortably warm. It should not be too hot or too cold. Although I know some friends whose babies don’t mind breast milk, that’s a little cold. There are so many options you can choose from when warming breast milk on the go. It’s important to consider which one is most convenient for you and your family especially if you’re on the road. Also, anticipation is essential. You need to monitor when the last feeding was and anticipate when the next one will be so you can avoid two things – a cranky baby and rushing to warm the milk. Have you tried any of these? If no, which will you choose? Share in the comments!